I don’t have much to say today Have a great weekend, guys! Enjoy this on-time comic… it seems like I’m catching up on life. For now! EDIT: Oh I thought of something to say – so how about that Zelda tomorrow, huh? How cool is it they made a direct sequel to A Link to the Past? Me and Victor were playing that game together in the earliest days of planning the comic, and the Temple of Terror was inspired by it quite directly. Night skies! Blarg-mouthed cave! Blarg-mouthed Goldie! Unfettered exclamation! On a side note, I’d like to see the last Pokemon in your friend safari if you have time. I would gladly… Although I have no idea what you mean by that, hah. I still haven’t beaten the Elite Four because I’ve been distracted by lawyers. Haha Oh Cyril. Lost History and priceless artifacts aren’t as important as Treasure! When will you learn? I know, right? What a nerd! I think this is the first time Goldgills has made an expression so crazy it broke his face. He’s totally proud of himself for splooshing up an entire island. And Goldie thought he couldn’t do it. I actually laughed for a solid few minutes; thanks guys! I needed that! Silly bard, history is for nerds. …and I keep misreading “Goldgills” as “Google”. 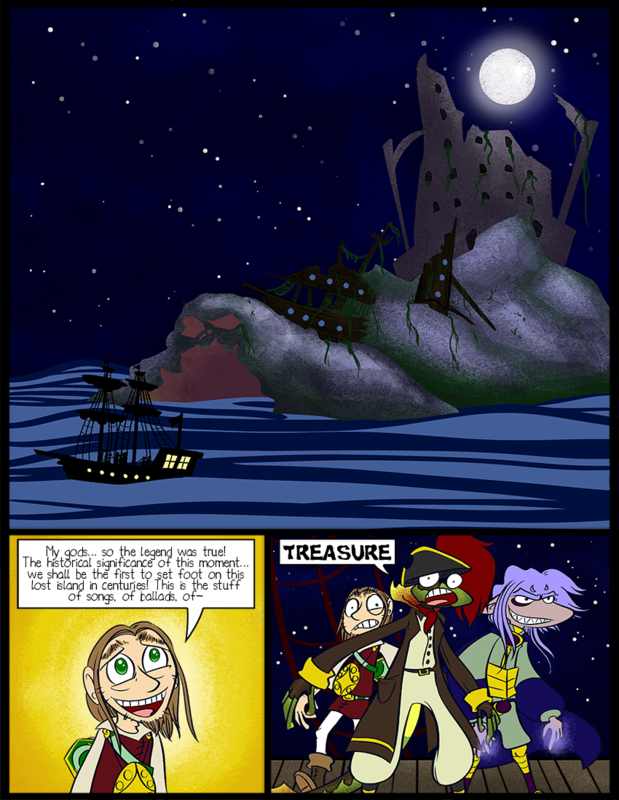 Goldgills, the piratical treasure-search engine! Be feelin’ lucky, mate? FACT: It’s not a pirate’s treasure stash if it doesn’t have at least one boulder or cliff face that looks like a skull. I just… LOVE the last panel. Skærva’s got his game face on. The gods have been warned. There’s no stopping him now. I love Skaerva’s expression – he looks mightily pleased with himself. I am looking forward to seeing them explore the island! That’s probably just something a really good liar said. Jeez, I am so tired, I thought Skärva rose a giant snail from the sea… Then I focused a bit. I need to sleep more, dumb work. Well, it WAS going to turn out to actually be a giant snail, but you foiled our plot twist! No-one is more important than Mr. The Wizard! If I may offer critique, the only thing that I’m inclined to mention is that the hard shading of the sea feels to me a little at odds with the otherwise soft shading of most of the rest of the scene; perhaps a softer technique might have made for a more cohesive whole? I don’t suppose that we would likely manage to convince the parties here to split the difference and swipe all the treasure to be sold to various museums, thus both gaining treasure -and- serving history?